Altitude : 1,800 m above sea level. Significance : The Regimental Centre for the Kumaon Regiment. Set along a 1,800 m high ride, Ranikhet is a beautiful thickly forested cantonment town in the Almora district of Uttarakhand in the Kumaon hills. . Ranikhet is a scenic getaway far away from the hustle and bustle of ordinary life. Discovered and built by the British in 1869, the hill station wowed Lord Mayo the then Viceroy of India who was so enchanted with this place and he wanted to move the army's Summer Headquarters from Shimla to Ranikhet. That did not happen but Ranikhet became and still is the Regimental Centre for the Kumaon Regiment. Being a cantonment, Ranikhet reminds the British Raj with its colonial buildings. Ranikhet is named according to legend, after Kumaoni Queen, Rani Padmini who liked this place so much, that her King, Raja Sukherdev, built her a grand palace here and named the place Ranikhet or queen's meadow. Even though, the palace has vanished but the place still has the beauty and serenity of the nature is enough to lure tourists. It offers wonderful views of the snowcapped Himalayas and the Nanda Devi peak. The hill station is blessed with a salubrious climate throughout the year. Set amidst dense forests (one of the dense forests of Uttarakhand) of full pine, oak, deodar, alder, suprius etc it has a diversity of fauna also like Leopard, Leopard Cat, Mountain Goat, Barking Deer, Sambhar, Wild Bear, Indian Hare, Red Faced Monkey, Jackal, Red Fox, Porcupine, Blue Rock Pigeon, Green Pigeon etc. One can find these animals in the evening on the motorable road. Ranikhet also offers good treks for trekking enthusiasts. The hill station has several trekking routes like Kausani, Dunagiri and Sitalakhet. 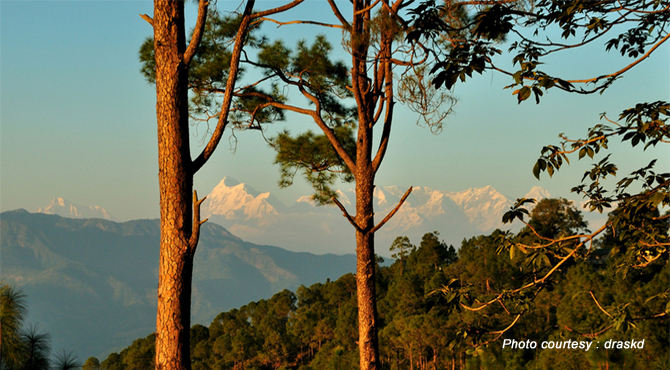 Ranikhet offers a stunning view of the great Himalayan peak Nanda Dev. This peak is 7816 m above sea level. It can be viewed from different places at Kumaon hills. This is a beautiful 260-acre fruit orchard run by the state government. Located 10 km to the south of Ranikhet, it is famous for their extensive fruit gardens like 36 varieties of apples, peaches, plums, apricots, pears and chestnuts. It is the first apple garden in India, cultivated by the Britishers. A Government Fruit Research Centre and cafeteria also within it. One can also buy honey and fresh fruit juice from here. The Bhalu Dam on the Kosi River is one of the most beautiful artificial lake situated in the reserved forest 3.2 km km below Chaubattia in the Cantt. area. Constructed by the Britishers in 1903, the Dam supplies Ranikhet with its water. Here, one can indulge in fishing also. To reach Bhalu Dam, one has to trek through dense forests. Upat has a beautifully located 9-hole golf course. One of the best Golf Ground courses of Asia, it is maintained by the Kumaon Regiment and civilians. It is 5.6 km away from Ranikhet located at a height of 6000 ft. Visitors have a game in Upat for Rs.500. Surrounded by dense pine forests, it's one side is flanked by a panoramic snow capped mountain peak. A private fruit orchard is also maintained here. Many documentaries, short films and even movies are filmed at this location. There are a number of locations in Ranikhet to view the sun set. Among them are; at Machkhali on the Almora-Ranikhet route. It is 13 km from Ranikhet. Here one can also enjoy the awe-inspiring snow peaks. This place also houses the U.P Government Agriculture Farm. The other are at Golf Ground located 1 k.m. away from Jhoola Devi Temple. It is situated in the heart of Ranikhet town. Specially for children it contains a herbal garden for those persons who are interested in herbal and medicinal plants. The park has a well developed lawns, colorful fountains, evening lighting etc. From here one can enjoy the snow capped Himalayan peaks also. It is one km away from Upat. It has an old temple of 200 years old, dedicated to goddess Kali. Rani Jheel is a huge artificial lake, located at 7500 ft above sea level. Developed between two natural ridges of Ranikhet Canossa Convent School and Kendriya Vidyalaya, this lake was built by the Cantonment board, for rain water harvesting. A check Dam constructed here to retain water reserved in the lake. One can enjoy boating in the lake. It is the major shopping area in Ranikhet. One can get all necessary goods from here. Zaruri Bazaar and Khari Bazaar are the other famous bazars in Ranikhet. Jhula Devi temple is one of the most ancient temples and famous temple in Ranikhet. Situated 7 kms from Ranikhet, the temple is dedicated to goddess Durga. Dates back to 8th century AD, it was built after the villagers prayed to Durga seeking her protection from the tigers and leopards that inhabited in this area. One can see thousands of bells hanging everywhere in the temple premises and its echoes can be heard from a distance. These are the testimony to the divine and healing powers of Ma Jhula Devi. Opens sunrise to sunset. It is another famous temple of the Kumaon hill dedicated to lord Rama. It is above Jhoola Devi Temple. It is a beautifully designed temple built by Indian Army’s Kumaon Regimental Centre, in 1978. Dedicated to Lord Shiva , Ma Kalika and Radha Krishna, it is located near to the Nar Singh ground. One can also visit a Gurudwara nearby and the factory of woolen garments. Situated 4 kms from Ranikhet is the Hairakhan Temple, a well developed and maintained temple dedicated to Baba Hairakhan. He was a famous saint in Ranikhet, who is believed to be an incarnation of lord Shiva. The view from here is breathtaking. Binsar Mahadev also called Bindeshwar (the temple is built by King Pithu in memory of his father Bindu) is located 19 kilometres from Ranikhet. Surrounded by thick deodar forests, it has architectural significance as well. Dedicated to Lord Shiva, the sanctum of the temple has idols of Ganesh, Har Gauri and Maheshmardini. Near to this, one can see a beautiful stream flowing. Apart from a Shiva temple, an ashram is also here. Established by the Britishers, it is one of the oldest clubs in India. Previously known as Gymkhana Club, it is a very suitable place for the visitors which offers many recreational activities like Billiards, Table Tennis, lawn tennis, skating, play cards etc. It also has a fine wood spring dance floor and a well-stocked bar also. It is situated at Som Nath Parade Ground. As name suggest , it symbolizes the bravery and dedication of war heroes of Kumaon Regiment. It is a huge war museum afforded by Kumaon Regiment. The museum houses articles, weapons, clothes related to so many battle won by the Indian Army and participated by the troops of different battalions of Kumaon Regimental Center. It is 8 km from Ranikhet. This place is famous for the Gandhi Kuti, a small hut where Gandhiji stayed.